tl;dr I seriously enjoyed this book. If you like Supernatural, you'll like this book. Description Meet Cas. Cas hunts ghosts. He uses his father's special knife, called an athem, which sends unruly spirits away. He moves to Thunder Bay in search of one particularly vicious spirit named Anna, whose throat was slit in 1958. She's been haunting her house every since, but things aren't exactly as they seem and Cas quickly comes to learn that. I really liked this book. It felt a little Supernatural… which was awesome because that show is awesome. Cas is following in his father's footsteps after his dad is killed by a supernatural being. He goes all over the world to hunt ghosts, accompanied by his Wiccan mother and ghost sensing cat. I swear I wasn't while reading it. I just forgot to re-read the description, and Cas can be a girls name… hey wait! CAS! So Supernatural. ANYWAYS! 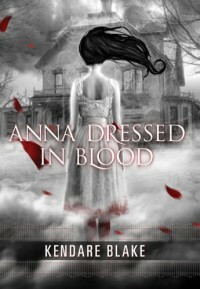 I the ghost scenes were creepy and awesome, and I loved how the story unfolded with Anna. Learning about what exactly happened to her, and why she was different from other ghosts. Then learning more about some voodoo and the thing that killed Cas' dad. Good storytelling, good pace, overall GOOD! So if you like Supernatural or ghost stories, you should definitely read it! LOVE! !